The heavens are lining up and a stunning blood red moon will grace our sky tonight during a special total lunar eclipse. If you’re anywhere in Australia, you’ll have a ringside seat — weather permitting — to the first total lunar eclipse since 2015. Those in the west will get the most mind-bending view if the sky is clear. This lunar eclipse occurs more than a day after the Moon has come closest to Earth in this orbit. That just makes it a ‘supermoon’ — the third in three months — based on a loose definition first coined by an astrologist. But it’s hard to spot the difference between a supermoon, even at its closest, and a regular full moon, says Dr Hill. “There’s a tiny difference, but it’s not something we can see or relate to in the night sky. “The ‘supermoon’ is just a bit of a superbuzz,” she says. Find out more in our Beginner’s Guide to the Moon. For much of Australia, the eclipse also just happens to fall on the second full moon of the calendar month — otherwise known as a “blue moon”. You may have read that this event is first time a “blue, blood moon” has happened in 150 years. 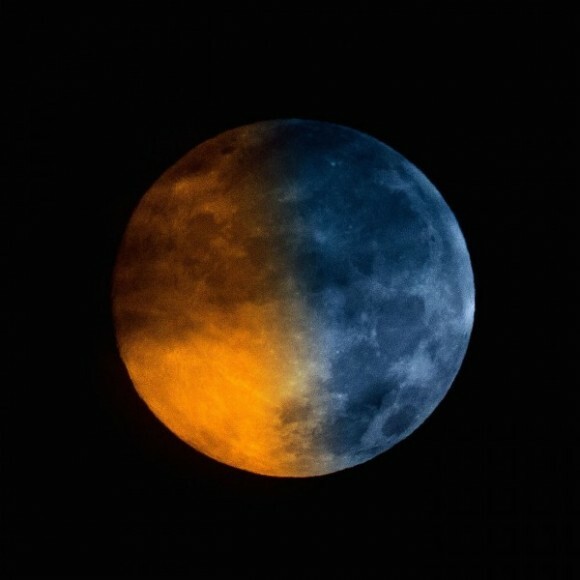 While it’s a relatively rare combination, some parts of the world (including Australia) were lucky enough to see a total lunar eclipse on a blue moon just over 35 years ago. A total lunar eclipse occurs when the Earth’s shadow moves across the Moon, blocking out the light from the Sun. The first of two total lunar eclipses this year will be visible right across Australia, Asia, the west coast of North America and the Pacific. And it will be a beauty, says astronomer Tanya Hill of the Melbourne Planetarium. “This one is going almost right into the centre of the Earth’s shadow, so it will be lovely and long,” Dr Hill says. “It will be a fantastic eclipse to see. Everyone across Australia will see the Earth’s shadow glide across the Moon at exactly the same time over three hours starting from about 10:48pm (AEDT) (see timezone conversions below). “Slowly you’ll see that shadow move across the Moon until it completely engulfs it. That’s when we have the beautiful colour of totality forming,” Dr Hill explains. And you don’t need special equipment to see it. “If you do have a telescope or binoculars you do get to see a better or closer view, but it’s certainly not required to watch that shadow cross,” Dr Hill says. Astronomer Brad Tucker of the Australian National University says the red appearance is caused by the light filtering and bending properties of our atmosphere. “That red appearance is really the sunrise and the sunset of the Earth falling on the Moon,” he says. Everyone in Australia will see the full eclipse, but people living in eastern states will get a different view to the west. 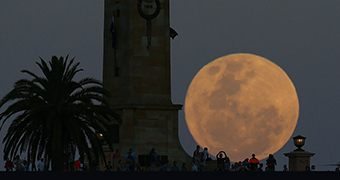 Note: Full moon occurs at 12:26 AM AEDT Feb 1 (and equivalent time zones). While the eastern states will see the full eclipse high in the sky, those on the west coast will see the eclipse start just after the sun sets and the moon rises. “They’ll have a really fantastic view of this strangely large moon as it wanders into Earth’s shadow,” Dr Hill says. This extra big moon is not because it’s a “supermoon”; it’s an optical illusion that makes things on the horizon look bigger. “Our brain tricks us into thinking the moon is much bigger than what it actually is,” Dr Hill says. A simple way West Australians can test this is to hold your thumb next to the Moon at the beginning of the eclipse, then put your thumb against the Moon when it is higher in the sky. “You’ll see that it hasn’t changed size at all,” she says. You may have read that a “blue, blood moon” is a “once-in-a-lifetime” event. That’s true only if you live in North America. The last time people living in North America saw a total lunar eclipse on a blue moon was on March 31, 1866. This eclipse was not a “supermoon”. Nor was it visible from Australia. “Everybody who is on the night side of the Earth will see the lunar eclipse, anyone who is on the day side won’t because the sun is in the sky and not the full moon,” Dr Hill explains. However, total lunar eclipses during blue moons occurred over Australia on December 30, 1982 and December 30, 1963. But, thanks to time zone differences, these were not blue moons in North America. Both these eclipses would have been “supermoons”. Even this lunar eclipse doesn’t happen on a blue moon for everyone in Australia. The full moon happens at a precise time — 1:26PM UTC January 31— everywhere around the world at the equivalent time. This means the full moon will fall on January 31 in most Australian time zones, but it will be 12:26 AM February 1 in New South Wales, Victoria, Tasmania and the Australian Capital Territory. “Technically it’s not a blue moon for those states, but for everyone else it is,” Dr Hill says. This entry was posted in Moons and tagged Blood Moon, Blue Moon, lunar eclipse, super moon.